Boston is a one-of-a-kind American city that offers visitors opportunities to relive history, immerse themselves in the arts, cheer for hometown sports teams, explore museums, discover "hidden" harbor islands and imbibe at a famous brewery or an even more famous bar. If you're visiting Boston for the first time or if you've never spent an extended period in Massachusetts' capital city, here are my picks for Boston's must-see sights and attractions. As New England’s largest, most important city, Boston is far older than the republic. But it’s also a contemporary center of high finance and higher technology, not to mention home of the very pub that inspired television’s long-running Cheers. The Freedom Trail, a 2.5-mile-long route marked on sidewalks by a redbrick or painted red line, winds along some of Boston's most noteworthy historical sites, including the Paul Revere House, Old North Church and its lanterns ("one if by land, two if by sea" to warn of British attack) and Old South Meeting House, where Colonists in 1773 orchestrated the less than genteel Boston Tea Party. Extending from the Boston Common to Charlestown Navy Yard, the Freedom Trail can be covered at a reasonable pace in an hour or so, with more time required for stops at any of the 16 sites along the way. Costumed characters at various points illuminate Colonial life. 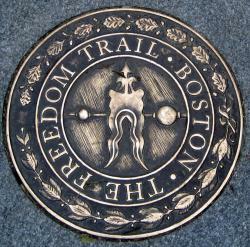 The trail starts at Boston Common and a ends at the Bunker Hill Monument in Charlestown. Home to more than 7,000 fish and aquatic mammals, the focal point of the New England Aquarium’s main building is the 200,000-gallon Giant Ocean Tank, encircled by a four-story spiral ramp. It contains a replica of a Caribbean coral reef and an assortment of sea creatures. To help keep the peace, scuba divers feed the sharks several times a day. Other exhibits showcase freshwater and tropical specimens, sea otters, and the ecology of Boston Harbor. Founded in 1636, Harvard is the oldest university in the United States, and among its graduates are seven U.S. Presidents, Widener Library, housing the world’s largest university book collection with more than 13 million volumes. Old Town Trolley Tours shows you the best of Boston on their 100-minute, fully narrated tour. As the official tour of the Boston Red Sox, guests will enjoy 17 stops, including Fenway Park, where you may disembark for shopping, dining and attractions. Each ticket comes with free admission to the Old State House Museum, a full–color guidebook, and coupons worth over $50 in savings. Old Town Trolley Tours has a 100% money back guarantee. 2 ½ hour fully narrated tour of Boston and Cambridge featuring 21 Boston sightseeing attractions. Your Upper Deck ticket allows unlimited re-boarding and travel throughout Boston and Cambridge over 2 consecutive days. Get off an Upper Deck Trolley at any of our 21 stops to shop, sightsee, and eat. Reboard at your convenience to continue your historic tour of Boston attractions.Boston Upper Deck Trolley Tours' modern luxury trolleys feature comfortable seating, climate control, a smooth ride, and great views of your Boston tour from elevated seating platforms. Our Cambridge loop features classic touring trolleys that evoke the charms of an earlier era.